Vendedor Tom-n-Jerrys Boat Center Inc. Stunning fishing boat, custom colours, Lowrance 12 & 7'" in cab 9" at rear helm, 4G radar, down and side scan, auto pilot, Xm weather app and radio. stereo,VHF, daul antennas custom lighting inside and rear deck, rigid exterior lighting around boat with fog covers, remote control spot light, fridge stove, diesel heater, bathroom, 8 quick release rod holders inside, shore power, Powered by 225 verado, tuned ECM by Whipple to be 340hp, 50 mph boat, excellent economy, power steering , 15 HP troller with troll master remote, complete Berwin system on boat, Berwin rod holders, reinforced mounts for scotty high speed downrigers included, huge fish hold with macerator live well at rear, windless with polished anchor,Thule storage on roof, this boat has under 200hrs, not a scratch, meticulously maintained. 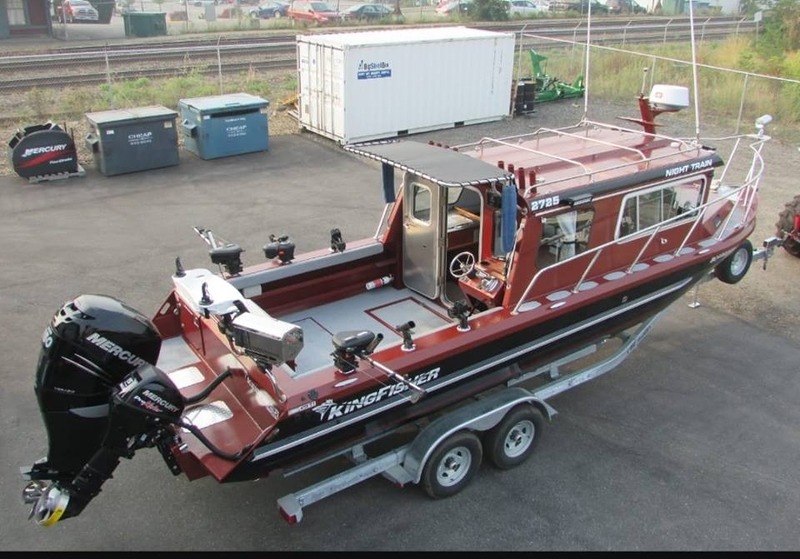 you will not find a cleaner boat, this is also a real head turner. Ez Loader trailer with custom wheels, wash through brakes , bow buddy. Have means to arrange financing, Throw in your tackle and your ready to fish, !! !